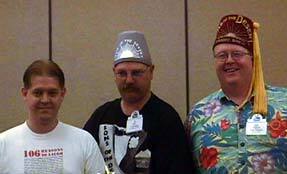 Since 1978, the Sons of the Desert has held an international convention every two years. 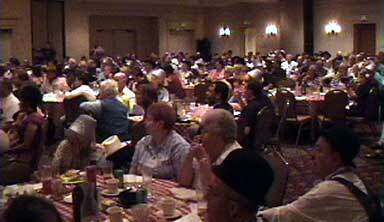 The 13th International Convention took place in Nashville, Tennessee. Delegates from around the world convened to honor the memories of Stan Laurel and Oliver Hardy. This report was provided daily from the convention by members of the Way Out West Tent of Los Angeles. Members in attendance include: Kris Wiley, Jimmy Wiley Jr., Jim Wiley III, John Duff, Janet Duff, Lori Jones McCaffery, Bob Satterfield, Bob Duncan, Stan Taffel, Jeff Stine, Stan Schulman, and Elaine Schulman. Conventioneers have begun to arrive at the Nashville Marriott Hotel, where this year's convention is about to begin. Included with registration was an assortment of "goodies," along with an unusual gray fez with silver tassel. In the lobby of the hotel, many Sons greeted each other while a player piano pounded out tunes from L&H films. Pictured at right are Kris Wiley, Rick Lindner, Jim Wiley Jr., Janet Duff, & John Duff relaxing the evening before the convention, near the hotel's indoor pool. This morning, a group of conventioneers left for a pre-convention excursion to Memphis (to visit Graceland). One of the two busses broke down while in Memphis, delaying their return to Nashville until 2:00 AM. It has been raining heavily throughout Tennessee today, making for a very wet arrival for most. Today's activities began with the Babe Hardy Putting Tournament. 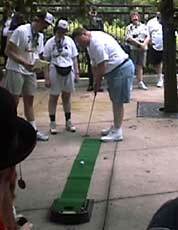 It was held outside (and we felt a few drops of rain) as dozens of conventioneers took three shots at making a hole in one on a small putting green. 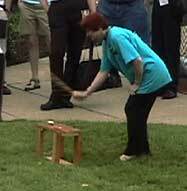 Immediately following, we moved to a nearby lawn for the traditional Pee-Wee contest. Several pee-wee's were driven long down the field; a few strayed into the nearby tennis courts. Inside, convention host Steve Brown answered questions about the scheduled activities planned for the convention. And after a brief lunch break, a new contest dubbed "Chickens Come Home" took place. The contest consisted of five rubber chickens, which each contestant had to throw through a small door in a "chicken coop." Winners of the contests will be announced later. At this afternoon's Grand Council meeting, the Columbus, Ohio Perfect Day Tent placed a bid for the 2004 International Convention. There were no other bids and there was no opposition, so a vote was taken and the convention will go to Columbus in two years. Our Grand Sheik Bob Satterfield arrived just in time to conduct the meeting. A letter from John McCabe was read by Dwain Smith, announcing that Mr. McCabe is disbanding the advisory council and assuming his prior role as the exhausted ruler. Roger Gordon and ITJ editors Alison & Dave Stevenson confirmed that the publication was financially stable for the time being, but recommended a slight increase to offset higher postage costs. John Ullah proposed the addition of a European editor of the ITJ, to be filled by Del Kempster. Details of this proposal could not be worked out, so it was agreed that the the current editors and Del would discuss the feasibility of the situation and report back at the next grand council meeting on Saturday. Later on, Charley Chase films were shown to a crowded cinema room. 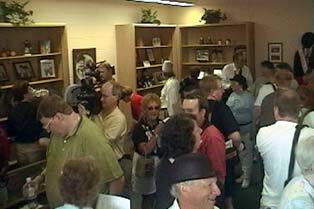 Many conventioneers waited eagerly to be the first ones in the Dealer's Room, which opened at midnight. This morning, the five celebrity guests in attendance conducted a questions and answers session with members of the Sons. The five guests (pictured from left to right) were Jay R. Smith (45 Minutes from Hollywood and Our Gang), Jean Darling (Babes in Toyland and Our Gang), Lois Roberts (widow of L&H prop-maker Thomas Benton Roberts), Dorothy de Borba (The Stolen Jools, Fra Diavolo, and Our Gang), and Jerry Tucker (Babes in Toyland and Our Gang). 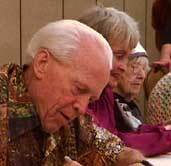 After the questions, autographs were signed. After an early lunch buffet, toasts were given and the busses were loaded for downtown Nashville. Although the downpour of rain had let up by the time the busses arrived downtown, the rains came back shortly after everyone had disembarked. As we walked through the pouring rain, fellow Sons could be found huddled in doorways trying to keep dry. A paddle wheeler took the Sons down the Cumberland River to Opryland Mills, a huge shopping mall next to the Grand Ole Opry House. 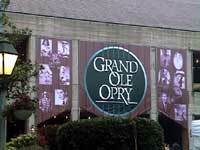 A large contingency of Sons of the Desert were in attendance at the Grand Ole Opry. The two and a half hour radio show included a mention of our convention, and our five celebrity guests were invited on the stage to great applause. The busses got back late from Opryland, but the conventioneers arrived just in time to catch the end of evening's ice cream social. The dealer's room was also open, and a late showing of Sons of the Desert took place in the cinema. This morning, celebrities signed autographs and everyone had lunch on their own. After lunch, the biannual trivia contest was held. 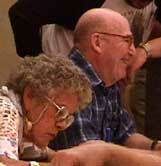 As at the previous convention, six teams of three competed in ten rounds of questions. Our own tent's team featured John Duff, Bob Duncan, and Jimmy Wiley Jr (pictured). The second and final grand council meeting was next, with the main issue involving editorship of the Intra-Tent Journal. It was decided that a board of three equal editors will publish the journal, with no geographic assignments to the editors' responsibilities. Del Kempster will join the current editors, Alison and Dave Stevenson, to make up this board. This proposal was voted on and passed unanimously. Also proposed was a "Sons of the Desert Hall of Fame," to honor prominent members of the organization at the new museum in Harlem, Georgia. This was voted down, but it was suggested that it could be proposed again in the future, if more details were provided. Discussion of how to make Laurel and Hardy more readily available on TV and video was raised. The subject of what time of the year International Conventions should be held was also discussed. Two seminars were held in the late afternoon, one talking about Stan Laurel's influence by English Music Hall and the other on Oliver Hardy's years spent in the town of Milledgeville, GA. The more formal of our two banquets started at 7:00, with a buffet dinner. After the tables were cleared, Stan Taffel and Mary Robin Brown performed a few songs from Laurel and Hardy films. Toasts were given, including two by our own Lori Jones McCaffrey and Bob Satterfield. All of the Grand Sheiks in attendance went to the front of the room to sing the Sons of the Desert Song. And a photo was taken of the 16 remaining people who have been to all 13 International Conventions, including our own Kris and Jimmy Wiley Jr. Following that, the evening's toasts were given and the classroom scene from Pardon Us was recreated live on stage (with Del Kempster in Fin's role). Then, a roast in honor of Dwain Smith was presented by Stan Taffel, Lori Jones McCaffrey, Elaine Smith, Lee McBeath, Marsha Opal, Jerry Tucker, Roger Gordon, Del Kempster, Rob Birarelli, and Steve Brown. Afterwards, Dwain spoke in his defense and suggested that he be the one to pick the next person to be roasted. The evening continued, with a screening of Love 'Em and Weep with live musical accompaniment. Then some rare clips were shown in Dave Stevenson's "Lost & Found" presentation. Around midnight, tickets were drawn for the raffle to benefit the celebrity flower fund. Afterwards, films continued in the cinema. The convention officially ended this morning at the "Going Bye-Bye" brunch. After a few trips to the buffet, the conventioneers settled down for some final announcements. Bob Satterfield was presented with the proceeds from the convention raffle, for the celebrity flower fund. Dwain Smith presented the "Founder's Awards" to the St. Louis Babes in Toyland Tent and to the London Live Ghost Tent. A number of trophies and awards were then presented to the winners of the various contests that took place during the convention. The winner of the Babe Hardy Putting Contest was Neil Lipson (Two Tars tent). Our own Bob Duncan came in second. The winner of the Pee-Wee Contest was Glen Campbell (Founding tent). This is the second time that Glen has won this award, and the first time that anyone has won this award more than once. Pictured (L-R) is the winning team of the trivia contest, which had a perfect score and consisted of Brad Farrell (A-Haunting We Will Go tent), Bill Cassara (Midnight Patrol tent), and Tracy Tolzmann (Block-Heads tent). The Way Out West Tent trivia team tied for third place. The winner of the Chickens Come Home rubber chicken toss was Charles Brown (Founding tent). A representative from all 12 of the past international conventions went to the stage to join this year's host and the next convention host. The bronzed pineapple statue was passed from representative to representative, as those in the audience briefly recalled each of those previous conventions. 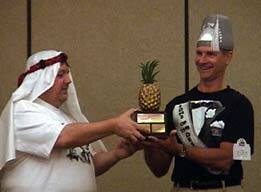 Steve Brown finally passed the pineapple to Rick Lindner, which marked the end of the 13th annual convention in Nashville (pictured). Rick said a few words to the audience, in anticipation of his convention in just two short years. The final presentation came with the retirement of the bronzed pineapple, to be replaced by an antique crystal pineapple. The old pineapple was presented to Lori Jones McCaffrey, who is credited with starting the passing of the pineapple tradition. With that, the hosts of the convention bid us farewell. Over 100 conventioneers boarded busses bound for the opening of the Museum of Laurel and Hardy of Harlem, Georgia, which will take place tomorrow. Busses left Nashville at 3 PM and didn't arrive at their destination until after midnight! Busses and a number of private cars left for Harlem bright and early, around 8 AM. The ride was short, and we were warmly greeted by the people of Harlem, Georgia. A breakfast buffet was provided at a nearby church, where the organizers presented awards to those who helped make the museum possible (including a few Sons). The celebrity guests from our banquet were also introduced. We then took a quick look around town, before the museum opening at 10 AM. Following the Pledge of Allegiance and the singing of the National Anthem, the museum was dedicated in honor of Eugene Clary, its largest benefactor. 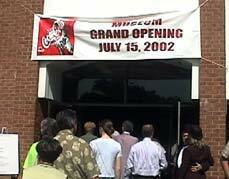 Our Gang celebrities helped cut the ribbon, and the museum was opened. On display inside were an assortment of collectibles, photos, books, posters, and other items featuring the likenesses of Stan Laurel and Oliver Hardy. In the back room is a theater, allowing for the viewing of the films of Laurel and Hardy. All in attendance seemed very excited to explore this new museum and impressed by the thought and care that was put into it. The rest of the day included a historical marker dedication in the town of Madison, GA, and a tour of Milledgeville, GA (where Oliver Hardy lived for a number of years as a child). Busses returned to Atlanta and Nashville afterwards. Hope you've enjoyed the coverage of this year's convention!